What do you say about a game that feels like you've played it before? A game that feels like one of the classic card games, but is new? A game that is simple, but enjoyable? A game that is inexpensive and quick? If these adjectives sound like a description for a snack of popcorn, that certainly would be a good analogy for this game: light, fast, enjoyable, but not-too-filling. 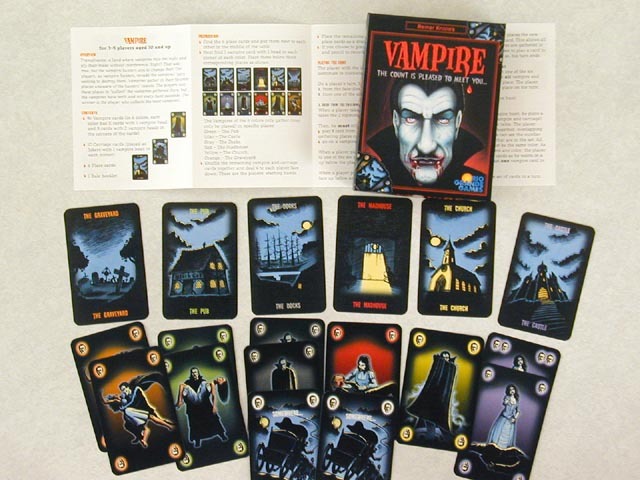 Vampire is a card game with simple mechanics and short play time. It plays very much like rummy or a large number of other melding card games where you collect sets and lay them out on the table. At the end of a game your sets are scored and compared to the other players. Unlike rummy, there is room for 3 to 5 players here. The pace of the game varies with the number of players. 3 players makes for a quick and uptempo game. 5 players proceeds a little more leisurely. Like many Knizia games, the theme is thinly pasted to the mechanics. There are 106 cards in the deck. There are 5 suits of vampires, one in each color of white, blue, green, read, and yellow. 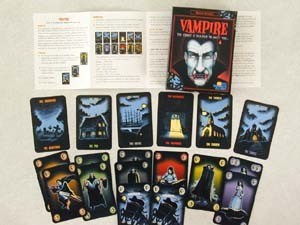 Each vampire card has one or two vampire heads which denotes the card's value. There are several "Somewhere" cards which serve as wild cards and may be played in any location. Finally, there are 5 location cards which serve as placeholders for the discards, but really serve no purpose for the game mechanics, much like the board in Knizia's Lost Cities . Although the artwork is terrific, the theme could just as easily have been abstract or some other theme based on 5 suits. discard one card to oneof the 5 locations. lay out a set of 3 matching cards. Scoop up the cards at one of the locations - in this case you must now lay out a set of 3 matching cards in one location. In both options, laying out cards, or melding, is called going on a vampire hunt. This is one example of changing common terms to try to evoke the game theme. If you lay out a set in a suit that you have already played, you discard the set with the lower score. The game ends when all the draw cards are gone, or one of the players has made a set in each of the suits. Then, the players count vampire heads in each of the suits, and the player with the lowest score in a suit discards that set. The remaining vampire heads are counted and the highest score is the winner. That's it. Sound simple? It is. Like Gin Rummy, there is always the decision to lay out cards or opt for a more valuable set. The longer you wait the more likely your opponent will beat you to the punch. Namely, if you are not making sets, you are making discards which helps the other players. Since the game turn order is always to the left, the player preceeding you dictates your style of play. If the player lays out many cheap sets, then you are not going to have many discards to choose from. Similarly, you can view the completed sets of the player to your left and decide which cards are safer to discard. If the next player had a giant set of red vampires, it will likely not benefit him if you discard one of the red vampires. Once again, like Lost Cities , these ideas are simple, but since there is no obvious way to win, no obvious flaw in the rules, it seems like these simple observations govern the strategy. So why not play one of the standard Rummy games? As much as I am a fan of the classic card games (Hearts, Rummy, Crazy 8's), I believe there is merit in revamping and rereleasing games similar to the classics. For one, the artwork is very good on this game. The dark comic-strip look to the cards turn this average game into something above averge. Credit goes to graphic designer Franz Vohwinkel, who is an artist on a tear. He has designed the most beautiful games of the past year, Ra and Taj Mahal . Furthing the theme, what other game theme could possibly have a rule "the player with the longest I-teeth begins?" But in the end, I like the game because it works. Nothing fancy here. No new mechanisms here, but a combination of existing mechanisms craftily put together to make an enjoyable game. Like popcorn, this isn't going to be a game to end your hunger, but it makes for an enjoyable filler or late-night ender. [an error occurred while processing this directive] Last modified: Thursday, 09-Jun-2011 12:37:10 MST.